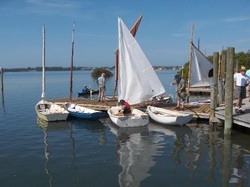 The Florida Institute for Saltwater Heritage has received a grant from the Estate of Jay K. Turner to establish and operate a youth maritime program. Jay Turner visualized a youth maritime program creating personal growth and self awareness in its participants by exposing them to conditions which call upon them to develop their own inner strengths as well as develop interdependence with all the program's participants. As a result of his generous bequest the Turner Maritime Challenge at Cortez has been established. Students will be introduced to the diverse facilities of F.I.S.H. They will be shown the workings of the boat shop and learn how to identify the tools, equipment, and materials used there. They will be taught how to row a boat, sail a traditional small craft and other nautical skills relevant to our maritime heritage and the traditions of Cortez. While learning about local maritime traditions, students will be instructed in seamanship and boat building skills. An appreciation for the coastal ecosystems will be emphasized by opportunities to explore the waters surrounding Cortez. In addition to the shop work, students will be instructed in the proper handling, launching, and hauling a boat. They will be taught how to safely operate a variety of traditional vessels in all weather conditions. They will further be given the opportunity to experience commercial fishing on a first hand basis. Upon successful completion of this course students will be offered more in depth opportunities to explore and understand man and nature’s role in maintaining a healthy sustainable harmony between these two forces that coexist on the Gulf waters. They will be taught to appreciate the value of our diverse coastal habitat and the role of the commercial fisherman who form the symbiotic relationship that has sustained and nourished us for hundreds of years. In turn we hope the students will teach others. A sense of stewardship is envisioned for the rivers, bays, estuaries, and the Gulf itself. As students become more capable and comfortable, the program will offer more sophisticated experiences with our natural world and maritime heritage. Extended outings on larger vessels will require greater understandings of the natural and man made forces. Overnight excursions to Egmont Key are foreseen and may lead to extended voyages to other Gulf Coast destinations like Cayo Costa and Cedar Key. Each course will require that the students be challenged by some sort of related activity. Confronted with adversity a student will more fully appreciate his surroundings, his associates, his life. By exploring our coastline and learning our maritime heritage, students will gain respect for themselves, for others, for that which we have created, for Nature and for History. The program is offered on a varying fee schedule to be announced. Students must pass a swimming competency test.